David Salman has plenty to keep him busy. There are plants to tend, businesses to run, articles and blogs to write (and if you read his blog, there's a rescued puppy named Jarrah who's always ready to play), and certainly an appreciative audience anywhere there are gardeners in the west. We are so fortunate to have him join us in Denver for "Inspired by Mountains and Plains: Redefining the Well-Adapted Regional Garden" Friday, May 21 at 7:00 p.m.
Its a story familiar to anyone whose left lush gardens behind to move into the west: rocky mountain gardening is profoundly different. While many mail order nurseries can send you a plant across the country, their experiences and catalogue descriptions aren't usually calibrated for a mile high and western dry. 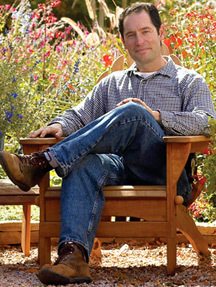 David Salman started High Country Gardens to be the mail order division of Santa Fe Greenhouses, his retail nursery company in Santa Fe, New Mexico. He tapped in to a desire for plants appropriate to western climates. And it seems he's quite good at it. High Country Gardens has been cited to me time and time again as not just a good source for plants, but a source that people love. Now with a decade-old presence online, I'm sure that the business is successful by any measure. But more than that, David Salman is encouraging water-wise gardening, xeriscaping, and other techniques that can make such a difference in a garden's water needs. Using a wide variety of plants that are well matched to the region can create a low-maintenance landscape in harmony with the environment. More than that, you have an opportunity to enjoy songbirds, hummingbirds, pollinators and other wildlife that enhance the garden. In addition to many xeriscape perennials, his catalog even lists a number of alternative, low water lawns. It takes knowledge and experience to make recommendations for gardeners across the region--especially when your pushing your audience in new directions. Its no wonder so few people have a reputation like his. This Friday (May 21, 7:00 p.m.) is his only listed speaking engagement in May. It is a sign of his appreciation for Denver, the Gardens, the Garden Conservancy and their open days program that he's willing to visit us at the height of the spring busy season. You could return the favor by visiting Santa Fe with the Gardens but "Inspired by Mountains and Plains" pools a lot of great gardening talent into one Friday night. What better way to ramp up for a terrific gardening weekend?